In the mood to get out, but not in the mood to exert too much energy? 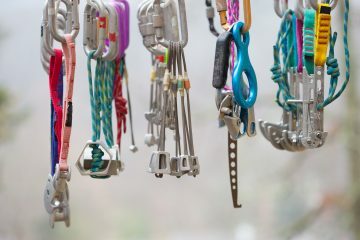 Maybe just want to zip up to a prominent high point to watch the day end? Funk Mountain is that kind of place. The views are excellent and the fire lookout at the top is often open and accessible to the public. 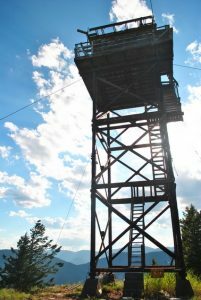 Explore the unusually tall lookout tower, one of the first in Okanogan County, and also the first to develop the heliograph, a mirror used to send Morse Code to locations several miles away. Then turn your head to the horizon and scope out the Tiffany Highlands to the west, the Pasayten and Sinlahekin Valley to the north, Okanogan Highlands to the east, and the Columbia Basin south. Activity: hiking/walking/running. 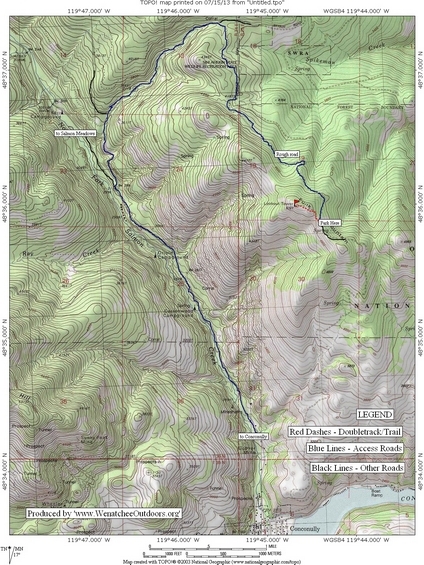 The route could be mountain biked but is too short to make it worth your while. Access. From Conconully, drive north on Main Street which becomes Forest Service Rd 38. About 1 mile after passing Oriole Campground on your left, turn right onto Forest Service Road 3810 (unsigned, but is the first road after Oriole CG). Stay on the main road until reaching a major junction approximately 0.8 miles from the turnoff. Take a right, staying on FR 3810. Stay on this road until reaching a junction with FR 3810-200. Turn right and follow this rough (‘funky’, you could say) road to an open saddle overlooking Conconully, with a closed gate just above. Park here. Trip Instructions. From the saddle, walk north up the road and around the closed gate. Follow this dusty track and within just a few minutes come to the lookout tower perched on Funk Mountain’s summit. Feel free to climb up onto the tower’s deck and even inside, but please respect the Forest Service’s property. Other Issues. Vandalism and littering have been issues at the lookout tower. If you visit, please treat this historical building with respect and care. Also, please leave the premises in better shape than when you arrived by picking up litter and trash left by others. Allowed: Hikers, horses, and mountain bikes. ATVs and motorcycles are also allowed so expect some noise. 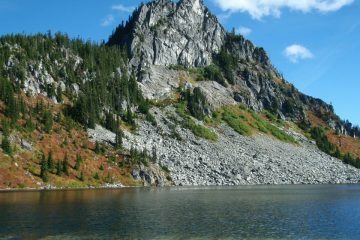 Land Ownership: Okanogan National Forest.